Ease of maintenance is one of a wooden floor’s main virtues. 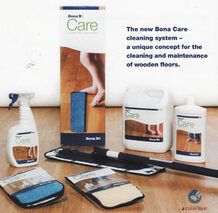 A lacquered wooden floor just needs regular sweeping and/or vacuuming to remove dirtand grit. Avoid revolving vacuum cleaner brushes and excess moisture. A damp mop and a wooden floor cleaner are allyou will need. Where appropriate, specialist products can be used to maintain the finish. The floor will lose its lustre in the long term. It can be refinished with new coats of lacquer, after a light sanding down of the original surface. Waxed wooden floors can similarly be swept, vacuumed and/or mopped on a regular basis, and buffed to maintain their shine. Wax, or a combination wax and liquid cleaner, may need a once or twice yearly application to maintain the floor in optimal condition. It should be applied evenly across the entire floor, left to dry for 20 minutes, and buffed to the desired finish.